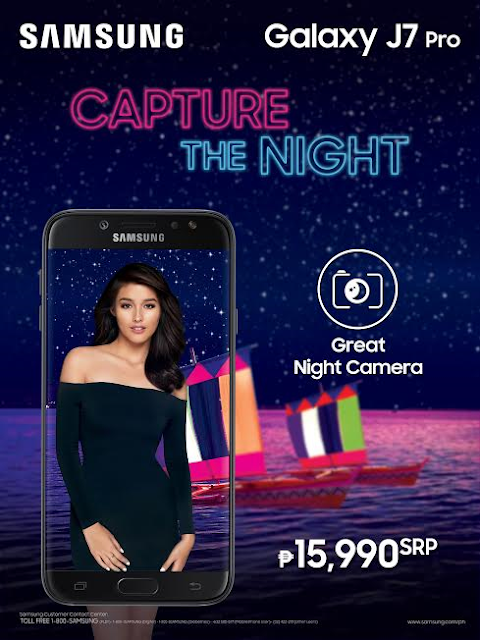 Capture the night with the new Samsung Galaxy J7 Pro - the smartphone that lets you stand out from the crowd with its Great Night Camera, premium display, and powerful performance. Sporting an innovative night camera, the Galaxy J7 Pro is the smartphone you need to capture bright, crisp photos from sun up ‘til sundown. With its bright higher-resolution 13MP rear camera equipped with an F/1.7 aperture, you can take vibrant and detailed photos at night, or in low light. Even in the darkest environments, you can just swipe right for the Night Mode to really bring out what you see in real life. As for selfie lovers, the Galaxy J7 Pro has a front LED flash to keep your face bright, and a wide selfie to enjoy with your friends and family. Embodying sleekness and modernity, the Galaxy J7 Pro’s sleek design dazzles at first sight. It is made of durable premium materials that complete the fluid design, which features a full metal body and 2.5D glass. With no camera protrusion and a curved back, the smartphone’s seamless and polished finish allows for a comfortable grip. Promising a great visual experience beyond its build, the Galaxy J7 Pro also comes with the most premium display with its 5.5” FHD Super AMOLED screen. Whether you’re viewing videos or checking out Instagram photos, you can enjoy stunning content on the most vivid screen that will take entertainment to new heights. To always keep you in tune with your plans for the day, the Galaxy J7 Pro’s Always On Display gives you the information you need at your fingertips. You can check the time, calendar, and your messages even when the screen is asleep. Running on powerful performance, the Galaxy J7 Pro is equipped with a 3,600mAh battery that promises enough juice to ensure that you’re always good to go. With an OctaCore 1.6GHz processor and the latest Android Nougat 7.0 OS, you can be assured of a seamless performance. Definitely a hardworking companion, the Galaxy J7 Pro comes with 32GB storage space and 3GB RAM, plus it supports microSD cards that allow you to expand storage capacity by as much as 256GB for all your photos and videos. It has a Dual SIM capability to give you more flexibility, and a fingerprint scanner for extra security. Priced at PhP 15,990 SRP, the Samsung Galaxy J7 Pro surely lets you Capture the Night and do so much more. It will be available in Samsung Experience Stores and authorized Samsung dealers starting July 15, 2017, and you can learn more about this over at http://www.samsung.com/ph/smartphones/galaxyj7pro.